Red Sox player David Ortiz has invested in a restaurant out in Framingham. If I remember correctly, I think ito's on Route 9 a little past the Natick Mall. From everything I've read, restaurants have been hurting due to the recession and and that's partly why we've been getting all these great deals at restaurants. But on the otherhand, maybe it's a good time to buy in cheap as an investment. The Red Sox slugger has taken a financial stake in Metro 9 Steak House in Framingham, which will be renamed Big Papi’s, the restaurant’s owner confirmed with the MetroWest Daily News late Tuesday. Peter Sarmanian, president of Classic Restaurant Concepts LLC, which owns Metro 9 along with The Kinsale in Boston, The Asgard in Cambridge and Desmond O’Malley’s in Framingham, told MetroWest the revamped eatery will complete its transition by the end of July, but remain open in the interim weeks. This one's probably going to be a pass for me. I'm big on celebrity chef owned restaurants. Not celebrity owned restaurants. If Thomas Keller or Nobu Matsuhisa opened up a place, I'd be there in a heartbeat. Sorry, Big Papi, but good luck with the restaurant venture. 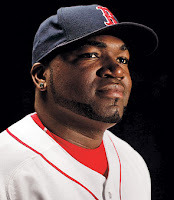 0 Response to "David Ortiz Invests in Restaurant"